The year is 1986. America and Russia are in the middle of a cold war. Reagan is in the White House. Berlin is still divided between the East and the West. And Martin Rauch, former East German spy, is in Africa having prevented a pre-emptive nuclear strike by NATO but has been forced into hiding, unable to see his former fiancée, now a junior intelligence agent, and his own son. Yet another plot calls Martin back into action all these years later, with Deutschland 86 returning to fill the void left from the masterclass first season that was the UK's highest watched foreign television series, Deutschland 83. Now a co-production with Amazon having aired on Amazon Prime in Germany (and on Sundance in the US) before finally in the middle of its run on television on More4 in the UK with all episodes currently available to watch on All 4's world service, Walter Presents, Deutschland 86 has a higher budget and this allows for some more globe-trotting adventures than before, looking beyond Berlin. We visit Africa and Paris among other locations as the show borrows from true events and pop culture inspirations to tell its story. The music is scarcer than in its previous series but is still used to perfection, with a memorable usage of Def Leppard's Rock of Ages being used in the finale in conjunction with perhaps the show's best set-piece, that features an extended sequence where a live performance of The Rocky Horror Picture Show plays a role. The show has charm, style and coolness to spare, and arguably, it's the coolest show on television at the moment. Yet it has plenty of substance to back it up, providing an interesting character study of just how much Martin has changed from when we first met him. The show adopts the Counterpart approach of fleshing out its supporting cast in its second season to make it a more well-rounded ensemble, but Jonas Nay is still exceptional everytime Martin is on screen. Maria Schrader reprises her role as Lenora Rauch, Martin's aunt and former handler for the Stasi, and is brilliant here. The actors are enjoying returning to their roles and taking these characters in new and exciting directions. The pace is constrained and well focused and there is an extended episode count here which means that it doesn't feel as rushed to tie everything up as it did before, but at the same time, manages to set the stage for the sequel, Deutschland 89, nicely. 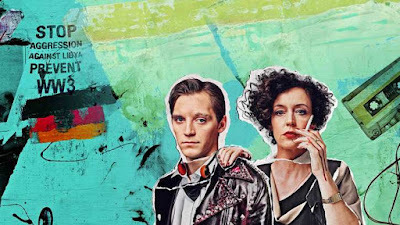 Deutschland 86 cements Anna and Jörg Winger’s series as one of the best around. It's smart, clever and navigates the world of espionage and the Cold War in a unique way that gives it its own distinctive and clear voice. Those ten episodes are very bingeable and addictive, and as a result I quickly devoured them. It's something you'll want to bear in mind going in as once you start watching you won't be able to stop. It's more fast paced than the slower but no less brilliant The Americans and fits into the spy genre as one of its best entries, making use of a good knowledge of history that weaves true events and fiction together seamlessly.